I've mentioned before that 3D printing is going to be a huge boon for cosplay, and it's already showcased itself plenty of times (remember that awesome Batman suit?) - but Redditor ANAGNO's new Ant-Man helmet is one of the coolest bits of 3D-printed cosplay I've seen so far. Not only is it a great looking replica - I really like the way it breaks apart into the back piece and the 'mask' section, to the point I almost kind of want the movie version to do it too - but it's just another brilliant example of how useful 3D printing can be to cosplayers. 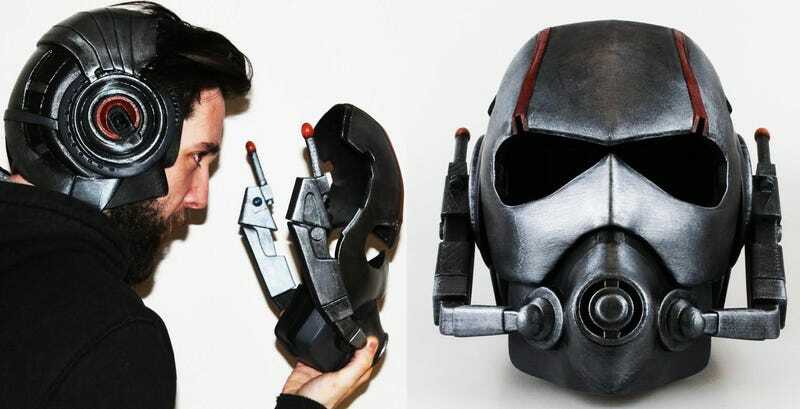 Months before the film is out, here's a great replica of Ant-Man's helmet, that now anyone with access to a 3D printer (and presumably the patience to put it together) and some paints, can make themselves. Open source cosplay! All the helmet needs is a red visor, something ANAGNO - real name Stefanos Anagnostopoulos - plans to fix ahead of showing the completed piece of at London Super Comic Con later this year. Fancy a go at printing it yourself? You can get the files to do so here, and check out a few more pictures of the print in this imgur gallery.